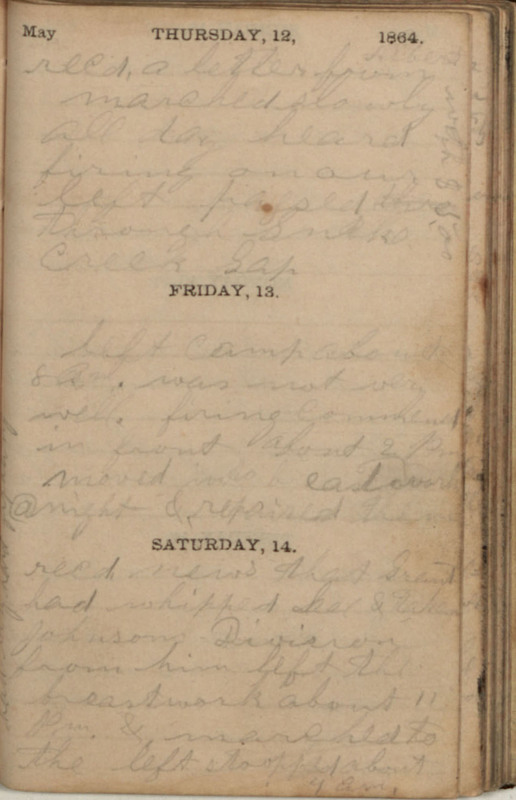 May THURSDAY, 12, 1864. recd. a letter from Albert (Vertically down from top right:-) with $5,00 marched slowly all day heard firing on our left passed through Snake Creek Gap FRIDAY, 13. left Camp about 8 Am. was not very well. firing Commenced in front about 2 Pm moved more eastward @ night & repaired [train?] SATURDAY, 14. recd. news that Grant had whipped [Lee?] & taken Johnsons Division from him. left the breastwork about 11 Pm. & marched to the left stopped about 4 am.